Are Cubans really the best? In my opinion, not really. Cuban cigars can be fantastic, but they are far too inconsistent. Construction and flavor seem to regularly vary from box to box, and sometimes stick to stick. Cuba is probably the best possible place to grow tobacco. Cuba is to cigar production as France is to wine production. It was a comparative advantage in terms of micro-climate. The problem is the production of Cuban cigars is state-owned by a totalitarian regime. No doubt, if the French wine industry was run by a Communist dictator for half a century, the great French wines would have turned unreliable and often poor. Under one government conglomerate, many Cuban cigars have lost their character. While I’m too young to have experienced it myself, I’m told there was a time when every brand had a unique flavor profile. Today, in addition to the construction issues and lack of properly aged tobacco, too often all Cuban cigars seem to be a variation, of the same basic blend. What happens when the embargo ends? Or, more likely, I’m asked something like, “You must be looking forward to the embargo ending?” My answer: Yes, but not for the reason you think. When the embargo finally ends, and you have to imagine it will eventually, there will certainly be a big run on Cuban cigars. Everyone who has ever smoked a cigar will want to try a Cuban and the result will be more rushed, poorly constructed Cuban cigars than ever. In other words, once the embargo ends I’ll probably smoke fewer, not more Cuban cigars. Still, I’m excited about one aspect of the embargo ending: the ability for non-Cuban cigar makers to use Cuban tobacco. Once the great cigar makers of our time get access to Cuban tobacco, which they can properly prepare and age and blend with other tobaccos we’ve come to enjoy, then I’ll really be excited about the embargo ending. We are in Europe, Romania to be exact. As you know we have no problem with embargo. Our problem is lack of cigar culture. You should feel lucky. Because of this embargo you had to smoke everything on the market and on this occasion you find great cigars. Unfortunately we know only of Cuba and / or Cohiba. But outside of 3-5 cigars, from my point of view, Cohiba is not brilliant. When the embargo ends, if it will end because there are political interest, Cuban cigars will be as expensive and not everyone will permit them. So the humidors will be full of Cuban cigars that will not sell. Which is again a great job. Why? Because we all know that some Cuban cigars are good only after being to mature. Honestly I think your information is dated and inaccurate. Granted, some sticks will have problems right out of the gate but not all or een most Cuban cigars have construction issues. I'd say more of them have cosmetic issues (water spots and green patches from water during curing). As for how good they are with age, I've found that a lot of fresh cigars, with a few months post box date, are great without the need to age them. Granted, most cigars do get better with age, but the sticks I've been smoking from 2011 have been wonderful so far. Aging will always help, but it really isn't necessary to wait a few months to smoke a new box anymore. Why would you include a photo of Che Guevara with this post? He was Argentine, not Cuban. Worst, he was a brutal anti-democracy murderer. If you were to post an article of Romanian wines, would you inlcude a photo of Nicolae Ceausescu? Exactly what was your thought process? Or did you not have one. My thought was he's a well-known Cuban cigar smoker, but also closely associated with the totalitarian regime of Cuba. After all Che was Castro's right hand man, and without them there would be no revolution, no nationalization of the cigar industry, no embargo… and this article would make no sense. Also, while it only crossed my mind now, the "mystique" around Che has some similarities to Habanos. After all, many people think Che to be some sort of populist hero and ignore his well-documented history of torture, murder and tyranny. Cigars are of course inanimate objects, but like Che, Cuban cigars are treated with -what is in my opinion – an undeserved reverence. (cigarphil;" There are far more great cigars made outside Cuba than inside." one dimensional. NC's will always cater to mostly Americans. I'd be interested to see where your 80% figure came from. You can always inform yourself by looking up other sources on the net. Thanks for the advice. 80% of an international market that does not include the U.S. doesn't equate to 80% of the world's cigar smokers. I've always wondered what percentage of cigars exported (from Cuba) to Canada, Switzerland, Mexico, England and elsewhere end up in the US. I've heard it said that the United States is likely the #1 consumer of Cuban Cigars. Ultimately, there's no real way to know. You do not have to post a photo of Guevara to make the point of your article. And by posting the photo, you are perpetuating the "mystique" which you implicitly disapprove of. Again, would you include a photo of Nicolae Ceausescu if speaking about It Romanian wine? While there is a connection, it is unecessary. And if you wanted to really draw the connection between the totalitarian regime and the embargo, why not post a photo of Castro himself? Certainly, he has a greater connection to all of those factors you cited. The reason is likely that he is not as "mysterious" as Guevara or enough of a draw in the popular culture. Which ultimately has nothing to do with the point of your otherwise well-thought out article. Of course it isn't necessary… it wouldn't have been necessary to include any photo. But since I felt it appropriate, and since it is my article, I put it there. I don't see how an article talking about Cuba's "totalitarian regime" contributes to the mystique for Che. Ceausescu (at least as far as I know) isn't particularly identified with wine while Che is (for better or more likely worse) associated with cigars. Perhaps if anything it will open some eyes. Wow . I would have expected more from you than the childish "if it makes you feel better." Your mocking tone is really juvenile. It has nothing to do with me. You wrote the article and included the photo. And by posting "but since I felt it appropriate, and since it is my article, I put it there," you really have not answered the question. I realize, thank you, that you felt it appropriate and it is your article. The question raised was why. Your response was no response at all. And it isn't the article that would contribute to Che's mystique. It is the photo. Your article does not even mention Che at all. Nor does it mention Castro by name. 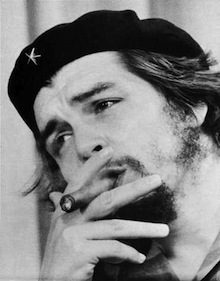 And please tell me where you get the idea that "Che is associated with cigars." Why? Because he was photographed smoking one? That holds true for millions. Did he produce, distribute or sell them? I am sure we can find a photo of Ceausescu drinking Romanian wine. Or of Stalin drinking Russian vodka. Would that satisfy your apparent low threshold for what constitutes being "associated" with something? I'm not kidding, I really have and wear that shirt, and trust me I am well aware of the horrors that Che is responsible for. I got the shirt because hipsters in my old neighborhood in New York would regularly wear actual (pro) Che shirts, hopefully because they were oblivious to all the terrible things he did. Google "Che Cigars" you'll find Che branded cigars and humidors, pictures of Che smoking cigars, etc… I think it's more than a loose/arbitrary association. Could I have picked something even more closely associated? Sure, but I didn't. This photo is in the public domain. I thought it was sufficiently related to the article, so I used it. Ultimately… I wrote the article. I chose the photo. I don't consider the use of the photo pro-Che.You seem to think it is. You would have preferred a different photo. Really not much else to say. And keep in mind that, under a ruler like Che or Castro, you wouldn't be able to have this blog or post your ideas freely. "Once the great cigar makers of our time get access to Cuban tobacco, which they can properly prepare and age and blend with other tobaccos we’ve come to enjoy, then I’ll really be excited about the embargo ending." __Here we go again !!!!! I'm sorry Patrick . I loved your article , BUT…..
American producers could never and will never leave nature along. They always have to mix and mangle something better then better. smoker never did enjoy a pure Cuban and this goes back to the early 1800's. mixed with tobacco from Florida. OR La Coronas made in N.J. mixed with other tobaccos.
" Clear Havanas", that's what they were called. I like this article and I generally agree with the author's observations, especially about how inconsistent Cuban cigars are today. But when and if the embargo ends, what makes you think the Cuban government will allow outside cigar makers to procure Cuban tobacco? Or even if the Cuban regime were to crumble as we know it, it's hard to imagine the Cuban tobacco industry breaking apart into subdivisions that will have to compete against one another. Isn't it more likely that one individual or one small group of individuals will control Cuba's cigar production for years to come? 90% of Americans just don't and never had , a taste for Cuban cigars. they are smoked as a curiosity change of pace smoke, nothing really serious . making a hit in Europe, they're not selling !!! they are just a curiosity. I suspect you're right Guy, but perhaps that's because for years the only (or at least vast majority of) premium cigars available in Europe were Cubans. American wines are (at least in my limited experience) pretty rare in Europe too, but that may be a function of preference for a style of wine making, not a statement about quality. Wow, I don't now about you guy's [reading all of the comments] but I found them very interesting, as a cigar smoker that just got back into smoking [three years ago] it was something that I did wonder about[Cuban cigars] what or why.are they really that good. I did find these comments to be enlightening to read, thanks Patrick for starting this conversion, and also the ''guy's'' who voiced there opinions. I do think that having recently smoked several big-label cubans, most are no better than non-cubans in the flavor department, especially this past year. They almost seem watered-down. 5 years ago, they all were unique and flavorful. But, must say when you do get a good one, boy o boy, nothing comes remotely close to a cuban. NOTHING. I find the smaller cuban labels in smaller sizes to be more flavorful and unique compared to non-cubans. One caveat, i had a Partagas Lusitania that truly embodies why cubans are and always will be THE standard. Holy moly what a smoke! Well having the chance to smoke both Cubans and NCs in my own opinion Cubans are better 99% percent of the time. Draw problems are almost always linked to bad aging or over humidity. I'm too young to confirm if the brands flavor profiles were more delimitated in the past, but it is pretty easy to know that I'm smoking a Monte, a Partagas, or a Ramon Allones. Just my two cents! I have smoked cigars for over 20 years and I think I can weigh in with some insight. First, the last consistently good cubans I smoked were produced in the early to mid 90s. After that, there was a rapid and steep decline in quality. I believe the time of the decline of cubans corresponds exactly with a huge increase in production (citation needed), which leads to the types of problems noted above. At their best, cubans have a very unique flavor profile that is earthy, at least medium to full bodied regardless of brand, with an aftertaste which is pleasant and lingering, which no NC can match. But only at their best. At their worst, you are smoking air. I had some Cohiba coronas that had no taste AT ALL. I tried to age some partagas serie 4 robustos and they were ok. But I smoked a montecristo white right after, and IT had more taste. So I agree with Patrick, other manufacturers with properly aged cuban tobacco will be needed to improve the current state of affairs. The Euros are smoking crap cubans out of habit. All knowledgeable cigar smokers know you cannot fix in the humidor problems of improper pre rolling and aging techniques, your bland cigar will just be more uniformly bland. The last 15 years of the embargo are a blessing for US herfers, IMO.